As the world’s population grows, it is also moving rapidly into city areas; so much that by 2050, Demographia predicts that seven out of 10 people on the planet will live in a city. This list by Demographia is an annual list of the population, land area, and population density of cities and urban areas with more than 500,000 inhabitants. It is particularly interesting to see the patterns throughout the top 10 areas according to population, as most growth is happening in the developing world. The only city in the United States or Europe that even makes the list is New York City, which is still behind cities in Indonesia, Philippines, and South Korea. Tokyo, Japan tops the list with an estimated population of 37.2 million in 2013, and Mexico City rounds out the top 10 with just over 20 million people. As far as the list of fastest growing cities around the world, most of it is happening in the developing world as well. China has 4 cities in the top 10 fastest growing, and Karachi, Pakistan tops the list with 80.5% estimated growth over the next decade. Istanbul, Turkey is number 10 on the list with an estimated growth of 25.3% over the next decade. Of course these numbers can all take a different path over time; war, famine, and environmental factors may cause significant changes. However, the numbers are suggesting that Asian and African cities will far surpass the expected growth in American and European cities. 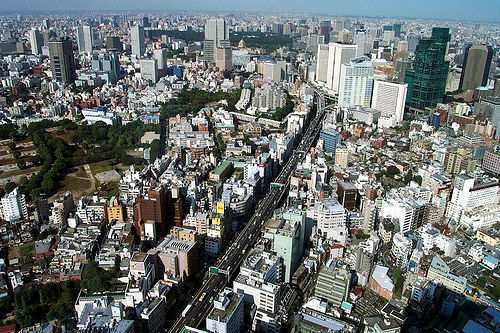 Image CC licensed by picdrops: Tokyo, the largest city in the world at 37.2 million people.